What does the Realise2* measure? The Realise2 strengths assessment measures 60 different strengths in comparison to 34 strengths by StrengthsFinder 2.0, and 24 character strengths by the VIA. The United Kingdom based Realise2 assessment helps you to marshal your realized strengths, moderate your learned behaviors, minimize your weaknesses and to maximize your unrealized strengths. *Note that the spelling for Realise2 is based from the United Kingdom. What are the Realise2 model definitions? 1. Realized Strengths – Are those strengths that you perform well in, feel energized by and are currently using in your life and roles. 2. Learned Behaviors – Are those strengths that you perform well (usually from gaining knowledge, skills, and practice over time) though you are not particularly energized when using them. 3. Weaknesses – Are those strengths that you do not perform well and are not energized by. No matter how much knowledge, skill and practice you remain average or below average in these strengths. 4. Unrealized Strengths – Are dormant strengths that you perform well, feel energized by however are not being fully utilized and need more knowledge, skill, and practice to maximize. 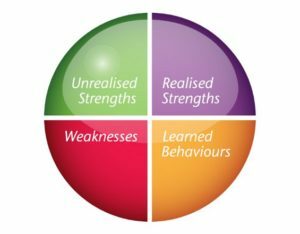 If you want to fully realize your potential through the strengths lens then I highly recommend that you measure your strengths through all available strengths based assessment tools. Enjoy exploring the Realise2 at CAPPeu.com with the founder Alex Linley and read his many positive psychology and strengths based books. https://brentobannon.com/wp-content/uploads/2013/01/What-Are-Your-Unrealized-Strengths2.jpg 440 565 brent https://brentobannon.com/wp-content/uploads/2017/01/obannonlogochangeweb.png brent2013-01-02 17:19:022016-02-10 20:06:47What Are Your Unrealized Strengths?